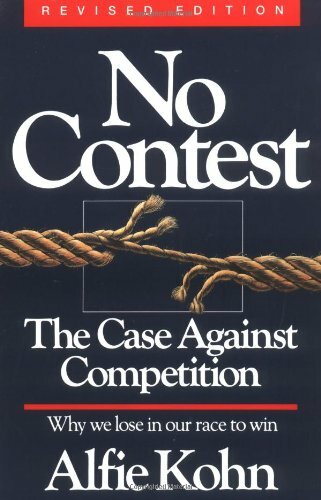 No Contest, which has been stirring up controversy since its publication in 1986, stands as the definitive critique of competition. Drawing from hundreds of studies, Alfie Kohn eloquently argues that our struggle to defeat each other — at work, at school, at play, and at home — turns all of us into losers. Contrary to the myths with which we have been raised, Kohn shows that competition is not an inevitable part of “human nature.” It does not motivate us to do our best (in fact, the reason our workplaces and schools are in trouble is that they value competitiveness instead of excellence.) Rather than building character, competition sabotages self-esteem and ruins relationships. It even warps recreation by turning the playing field into a battlefield. No Contest makes a powerful case that “healthy competition” is a contradiction in terms. Because any win/lose arrangement is undesirable, we will have to restructure our institutions for the benefit of ourselves, our children, and our society. For this  revised edition, Kohn adds a comprehensive account of how students can learn more effectively by working cooperatively in the classroom instead of struggling to be Number One. He also offers a pointed and personal afterword, assessing shifts in American thinking on competition and describing reactions to his provocative message.